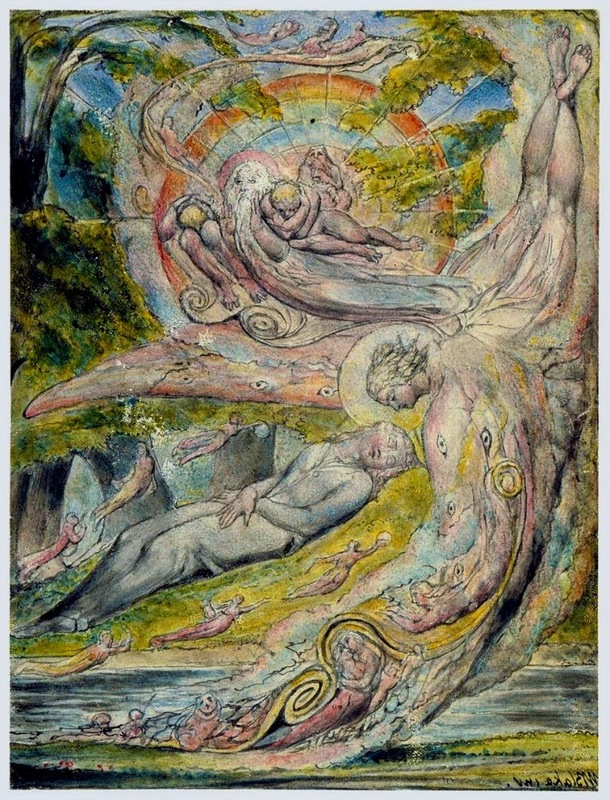 Of all William Blake’s visionary images, perhaps the most radical and distinctive is that of the whirlwind. Sometimes it is divine, other times decidely secular if not downright sinful. No other artist could have painted The Circle of the Lustful: Francesca da Rimini (c 1824), more popularly known as The Whirlwind of Lovers. This article considers where Blake’s whirlwinds came from, and how they came to have eyes and to form cars. Images of mystical blasts similar to whirlwinds had occasionally appeared earlier, but it was probably the visionary paintings of Hieronymus Bosch which triggered a steady stream of such images. 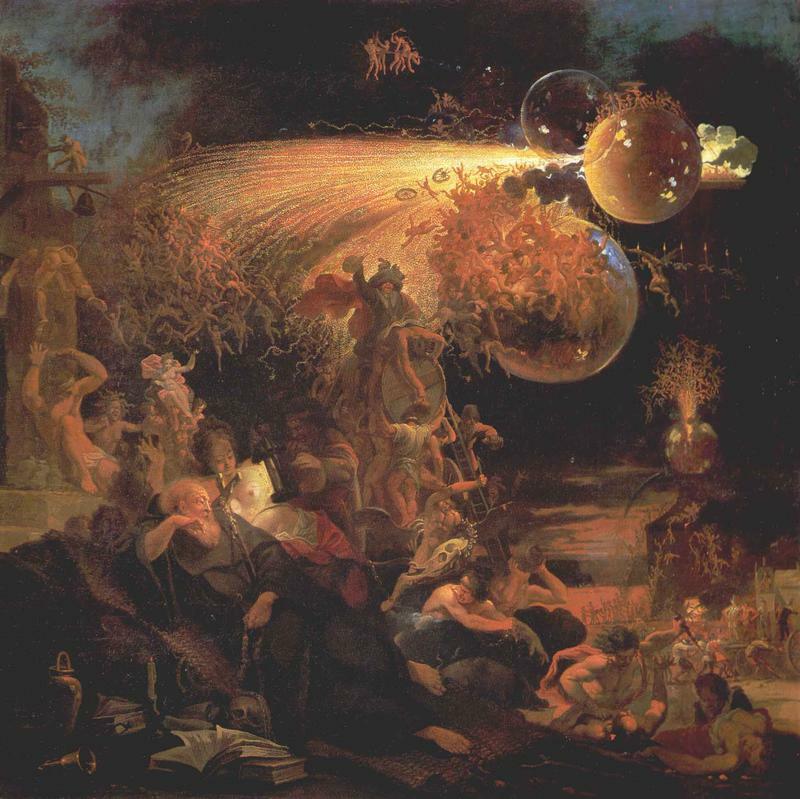 By about 1685, when Domenicus van Wijnen painted this vision of The Temptation of Saint Anthony, torrents of daemons and fairy-like creatures were becoming organised into formed streams. These cascades of bodies became further developed in the paintings of Henry Fuseli, here in his The Vision of Catherine of Aragon from 1781. Blake and Fuseli became friends in 1787, and Blake would undoubtedly have seen and discussed this work well before 1800. The figures in the upward stream are still quite separate from one another, and the stream itself is not clearly defined, its edges blurred rather than crisp outlines. In Fuseli’s Tiresias Appears to Ulysses During the Sacrifice (1780-85), the cascade is more organised, and the individual figures from which it is composed are becoming subsumed in the stream. Its edges are still not well-defined, though, and it has not formed the tube which is so distinctive in Blake’s whirlwinds. 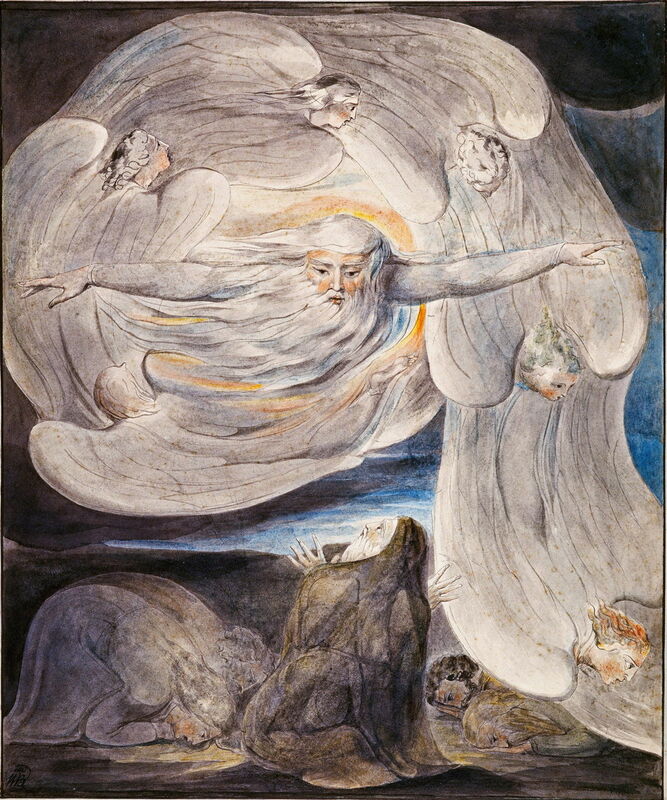 As far as I can see, Blake’s first use of a ‘divine whirlwind’ was in his Job Confessing his Presumption to God who Answers from the Whirlwind, painted for Thomas Butts between 1803-5, and the basis of a later illustration for the book of Job. This refers to the book of Job, chapter 40, verses 3-6. Half a dozen swooping angels here trace a loop, with the figure of God at its centre. The outlines of the angels’ wings form a clearly demarcated and smooth tube, although the individual angels remain distinct from one another. 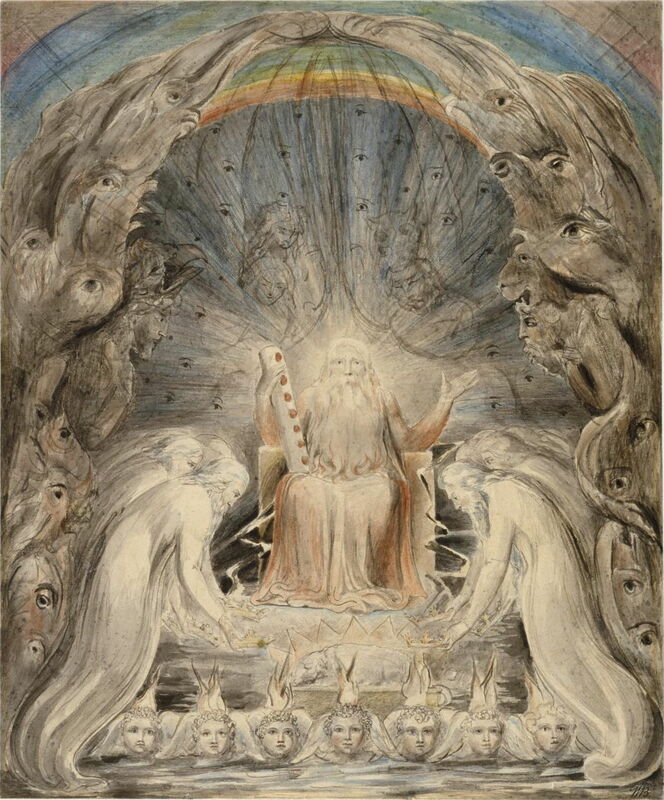 The Four and Twenty Elders Casting their Crowns before the Divine Throne, from the same period and series of watercolours for Thomas Butts, uses a similar visual effect to show a passage from the book of Revelation, chapter 4 verses 2-11. Here they are intended to represent the “four beasts full of eyes”, while the twenty-four elders of the title fall down and worship God in the centre. 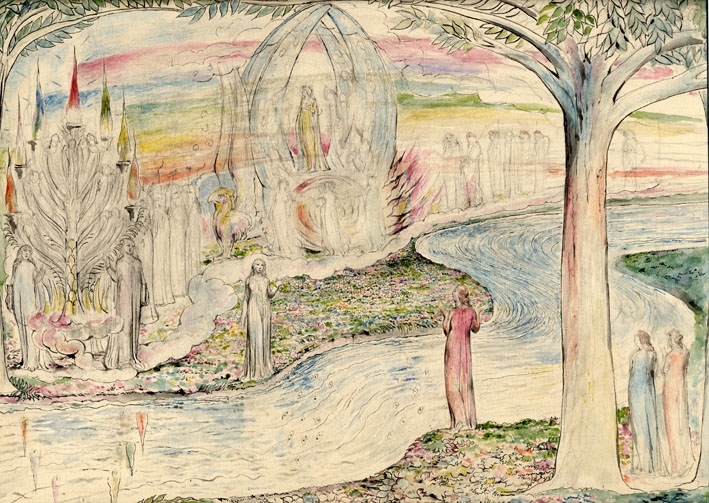 It is also worth noting the observation of John Gage that the rainbow shown here, and that in Blake’s Dante painting below, has the order of its colours reversed, making it an inverse Newtonian rainbow. Prior to 1803, Blake painted his rainbows according to Newton, with the red uppermost. Gage believes that Blake reversed the order after he had seen George Romney’s painting Newton and the Prism (1794) in about 1803-4. 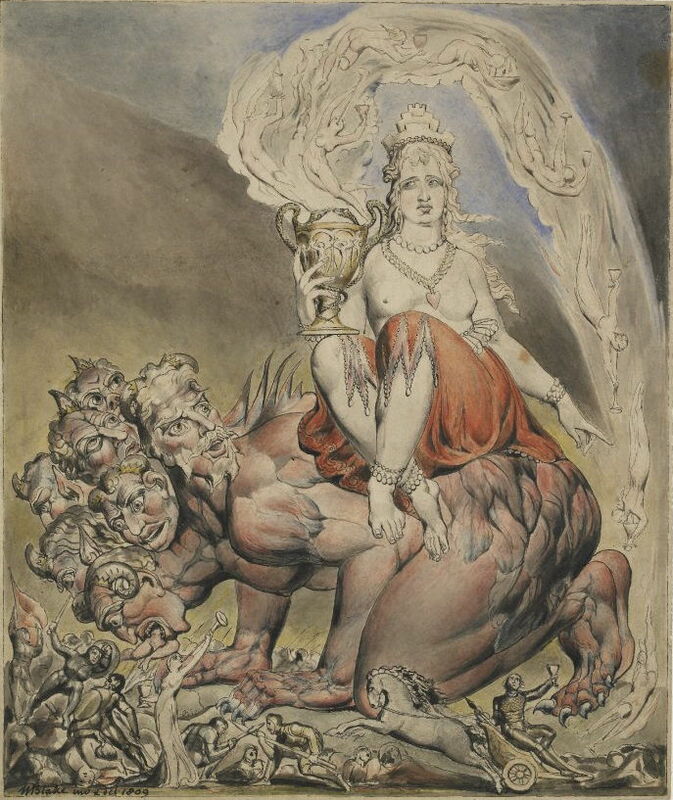 Then in 1809 comes this, The Whore of Babylon, from a small series of watercolours depicting visionary scenes from the book of Revelation, which Blake painted for Thomas Butts. The stream of naked figures which emerges from the chalice held by the whore of the title is well-defined, and curves tightly around the top of the paper, to cascade down its right edge, where it presumably deposits its miniature figures to populate the chaotic scenes at the foot. 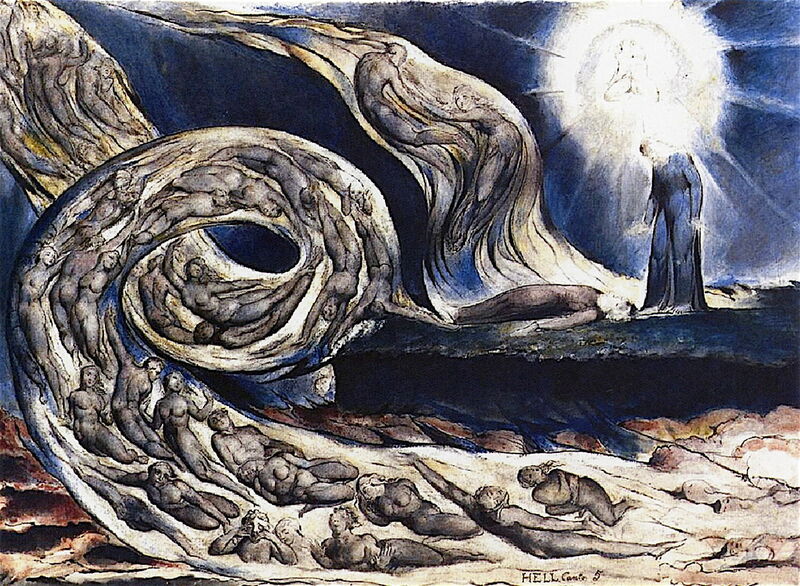 As with Blake’s other phantasmagoric images, the divine whirlwind appears most in his later works. 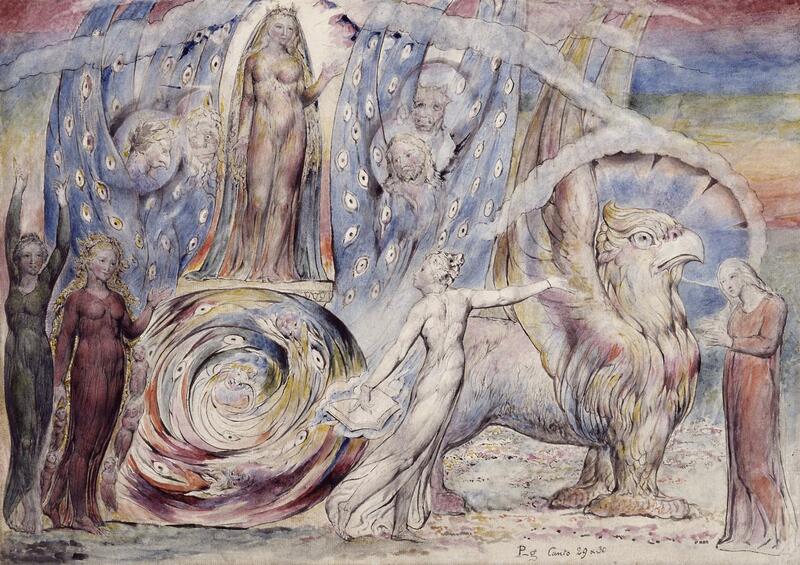 This watercolour of Milton’s Mysterious Dream from about 1816-20 combines sweeping curves of figures with abundant eyes. This is based on Il Penseroso, lines 139-140 and 145-154, although neither that text nor Blake’s notes mention the significance of the many eyes. 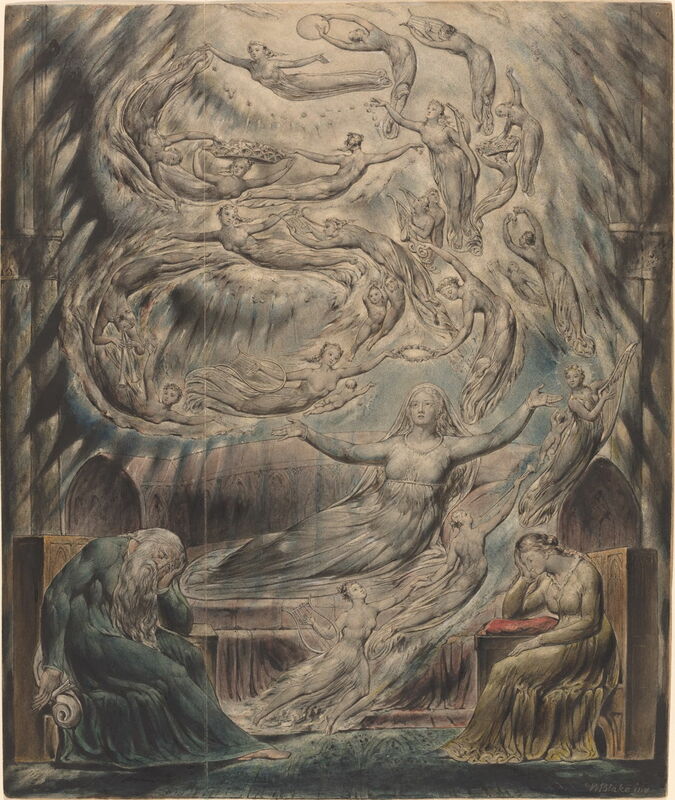 William Blake (1757–1827), Queen Katherine’s Dream (c 1825), pen and ink with watercolor heightened with white and gold over graphite, 41.2 x 34.6 cm, The National Gallery of Art (Rosenwald Collection), Washington, DC. Courtesy of The National Gallery of Art. 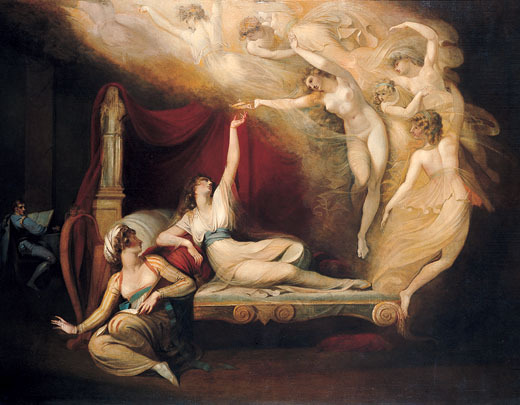 In about 1825, Blake painted his version of Queen Katherine’s Dream, clearly inspired by Fuseli’s. The exuberant stream of figures dominates the painting, breaking up into formations of individual figures, and coalescing in other places to form local ‘tubes’. 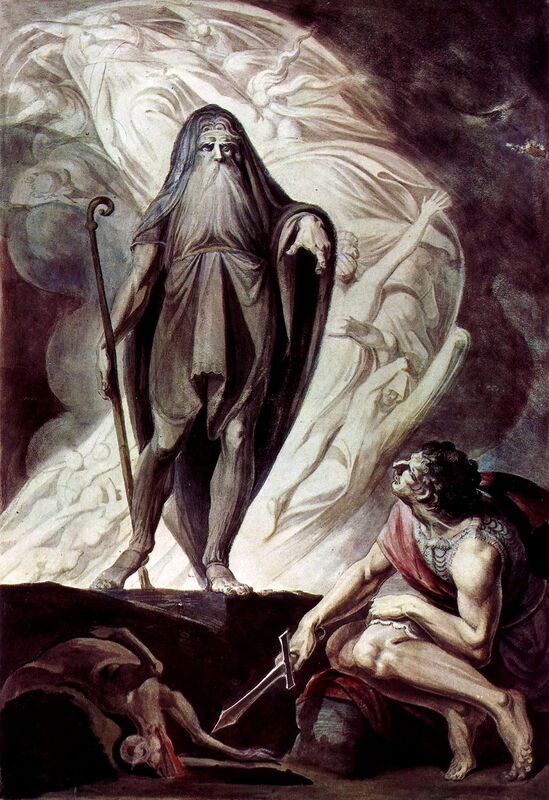 This becomes a recurrent image in the uncompleted paintings which Blake was still making at the time of his death, illustrating Dante’s Divine Comedy for his patron, the artist John Linnell. Although some of these are obviously far from complete, Blake seems to have finished The Circle of the Lustful: Francesca da Rimini in about 1824, and it was one of the seven which had already been etched. This accompanies Inferno, Canto 5, lines 25-45 and 127-142. This whirlwind doesn’t carry God or angels, but the adulterous couple of Francesca da Rimini and her lover Paolo, her husband’s brother, naked and contorted as they are swept through the loops. The figures are shown quite distinctly inside a well-defined tube. With multiple figures representing the couple, Blake has used a technique to indicate their movement which did not become popular until the twentieth century, when it had been reinforced by the motion photography of Eadweard Muybridge. William Blake (1757–1827), Beatrice on the Car (Dante’s ‘Divine Comedy’, ‘Purgatorio”, Canto 29) (1824-7), watercolour over graphite on paper, 36.7 x 52 cm, The British Museum, London. Courtesy of and © Trustees of the British Museum. Blake used a similar device to show Beatrice on the Car, Matilda and Dante (from Purgatorio, Canto 29, lines 13-150) (1824-7). This unfinished painting shows from a distance how the ‘car’ within which Beatrice stands, just above the centre of the painting, consists of organised ‘whirlwinds’ of figures. It is this close-up of the ‘car’ (chariot) which represents the ultimate in Blake’s whirlwinds, in Beatrice Addressing Dante from the Car (1824–7). This accompanies Purgatorio, Canto 29 lines 92-129, and Canto 30, lines 31-33 and 64-81. Here the whirlwind forms the wheels and structure of the vehicle, and is rich in floating eyes. This shows the closing stages of Dante’s Divine Comedy, where the author is being guided through heaven by his ideal woman, Beatrice. The heads of the four apostles are shown on the sides of the car, at each side of Beatrice. Beneath her a formed vortex of whirlwind, bearing more eyes, makes the wheel. There are references to Blake’s self-published book Vala, or The Four Zoas, and the eye motifs may have originated there in Blake’s concept of the ‘seven eyes of God’. William Blake’s divine whirlwinds are a good example of a visual device which he saw in previous art – here the paintings of his friend Henry Fuseli – and which he developed into a unique, powerful, and visionary motif of his own. They combine strong graphic design with his distinctive mystical references in a way that could only ever be Blake’s. Posted in General, Painting and tagged Blake, Bosch, Dante, Fuseli, Linnell, Newton, painting, rainbow, van Wijnen, whirlwind. Bookmark the permalink.